Do I need orthotics? Find answers to your questions here. People with excessive foot pronation of the feet (also known as fallen arches or flat feet) account for nearly all of the people who need orthotics in order to function well. Only about 5 % of orthotics will be made for high arches and about half that number to offload pressure and help heal wounds. We estimate that around 40% of the population have symptoms that would benefit from using arch supports. Given that only around 10% of the Australian population does, there are a lot of people out there suffering pain unnecessarily. When your feet hurt, it is obvious that you might have a foot problem. A podiatrist is the logical place to go for help. What many people don’t realise is that poor foot function can cause widespread pain across your body. Think of your skeleton like a multi-storey building. e wouldn’t expect the window frames of the top floor to be straight if the foundations are crumbling and the whole structure is out of alignment. Treatments including rest, massage and anti-inflammatory medication will probably help to relieve most types of pain until the movements that cause the pain occur again. Unfortunately, when that is just simply standing or walking, relief will be short lived. Where might I get pain – do I need orthotics? Here are two diagrams showing the most common places to experience pain due to poor foot function. Diagram 1 shows the bottom surface of the foot. Diagram 2 shows a whole body from the back. The kneecaps are also indicated on this picture. Timing of pain that occurs when you need orthotics. 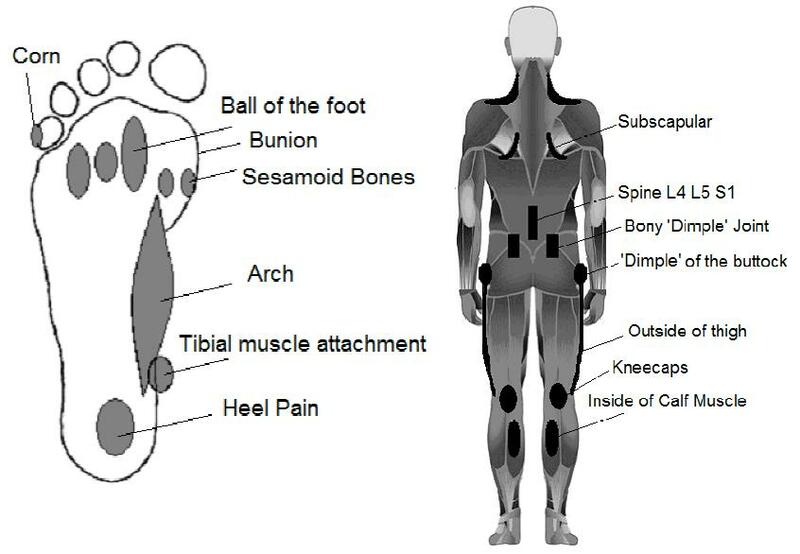 The diagram above shows many points of potential pain. These can all come about from poor foot function. Each point is in a place where a body part is put under excessive load. Usually this overloading occurs because the body is using a structure at the wrong angle, wrong time or in the wrong way. Overuse can cause an inflammatory response in damaged area and there are classic times when inflammatory conditions will be worst. The first few minutes out of bed can be very painful. All soft tissue shrinks when cold and needs time to ‘warm up’ with movement. This is just like an athlete would do to prevent injury before working hard. Often the intensity of the pain will lessen with movement after five to ten minutes of moving around gently. It will often escalate again if activity is prolonged. In 2/3 of cases, standing still for long periods is worse for the injury than walking. If any of these patterns of pain sound familiar to you, it may be that a visit to the podiatrist is long overdue. Call us today to see if we can help you achieve immediate pain relief and long term correction. Wouldn’t it be nice to Walk Without Pain?